Free City Sightseeing New York® Hop-On, Hop-Off Sightseeing Ferry Ticket! Valid for 24 hours, 48 hours, 72 hours, 4-day OR 5-day from the time the ticket is issued. Downtown Tour: Departs from 8:00am – 6:00pm with frequent departures. A complete loop takes approx. 3 hours. Uptown Tour: Departs from 9:00am – 5:00pm with frequent departures. A complete loop takes approx. 2 hours. City Sightseeing New York® Hop-On, Hop-Off Sightseeing Ferry: Daily 10:00am to 4:00pm. Ferry lasts 90 minutes. Museum of the City of New York: Open from 10:00am - 6:00pm. Vouchers must be exchanged at the Gray Line CitySightseeing New York Visitor Centre at 777 8th Avenue, between 47th and 48th Streets. You can end the hop-on, hop-off tour at any of the stops. Discover the very best of the Big Apple with this great value New York sightseeing package! Tour New York at your own pace with the New York Hop-On, Hop-Off Tour. 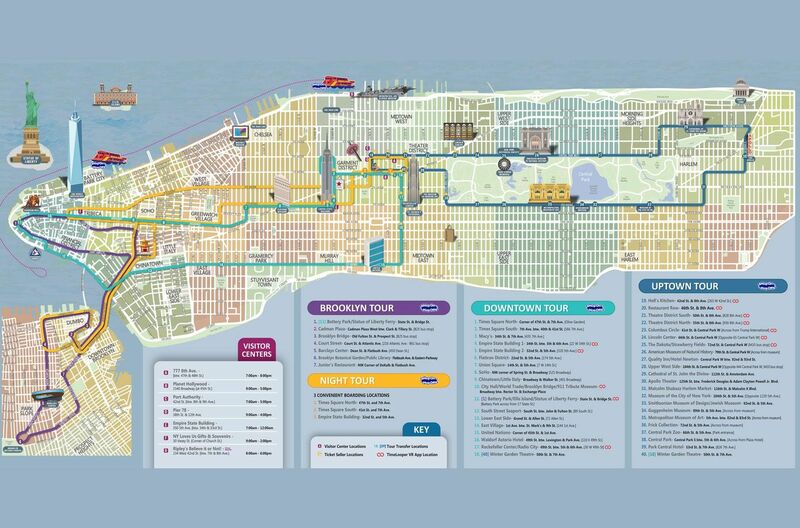 The tour has four routes; Downtown, Uptown and Brooklyn Tour along with an Escorted Night Tour. These 4 routes have more than 50 stops and ensure that all the major New York highlights are covered. Plus you also get a FREE ticket for the City Sightseeing Hop on Hop Off ferry and entrance to Museum of the City of New York or New York Historical Society Museum - all for one low, unbeatable price! You can hop on and off these routes as much as you wish as per your chosen ticket option. Frequent departures mean that your valuable New York sightseeing time will not be wasted waiting for the next bus. While on the bus, an English-speaking official New York tour guide will ensure you don’t miss a thing. The recorded tour content (available in multiple languages) and narration is enhanced with music and sound effects, mimicking the street sounds of NYC. To complete this fantastic package, you will also get a Eat and Play Card that offers a fantastic range of savings at Manhattan’s best-loved restaurants, shops and attractions – meaning you save even more money! Each card is valid for up to 4 people. And for even more value - you can also opt for a VIP Pass, which allows priority boarding at all stops on the buses and Cruises. The Tour is operated by Grayline CitySightseeing New York. Here is the list of attractions that are in store for you! Downtown Tour: View the most famous neighborhoods, attractions and places of interest: Empire State Building, Greenwich Village, SoHo, Little Italy, Chinatown, World Trade Center site, Battery Park (departure point for Statue of Liberty/Ellis Island ferry), South Street Seaport, Times Square, Rockefeller Plaza, Radio City, United Nations, Fifth Avenue and more. Brooklyn Tour: Enjoy wonderful views of the Manhattan skyline and Brooklyn Bridge from historic Fulton Ferry Landing, great cultural institutions including the Brooklyn Academy of Music, Brooklyn Museum of Art and Botanic Garden and you will also see Brooklyn Promenade/Cadman Plaza, Atlantic Avenue, Barclays Centre, Brooklyn Public Library, Grand Army Plaza, Old Fulton Landing and Fort Green Park. View the bright lights of the big city on this escorted evening tour. Treat yourself to unforgettable views of the lit marquees in the Theater District and the light displays at the top of the Empire State Building and the new One World Trade Center. After passing through Chinatown, Little Italy and into Brooklyn, experience the spectacular views of the illuminated skyline and its sparkling reflection along the East River. The New-York Historical Society: Founded in 1804, the New-York Historical is the oldest museum in New York City. It is dedicated to curating the history of New York City and celebrates the city's cultural diversity. The Museum of City of New York: The Museum of the City of New York celebrates and interprets the city, educating the public about its distinctive character, especially its heritage of diversity, opportunity, and perpetual transformation. It serves the people of New York and visitors from around the world through exhibitions, school and public programs, publications, and collections. City Sightseeing NY Visitors Center at Pier 78, West 38th Street and Hudson River, can accept vouchers for CitySightseeing New York® Hop-On, Hop-Off Sightseeing Ferry and Skyline Cruise only. Vouchers must be exchanged for actual tickets before starting the tour. The Free Museum ticket is only valid for entrance into the Museum of the City of New York or New York Historical Society. Recorded narration is available on Downtown Tour, Uptown Tour, Brooklyn Tour and the Night Tour. Night Tour is not Hop-On, Hop-Off. The New-York Historical Society is closed on Mondays. Tickets are valid from the time you redeem your voucher at the Gray Line CitySightseeing New York Visitor Centre. Tickets for attractions and City Sightseeing Hop-on, Hop-off Ferry are valid as indicated on ticket stub. Please be sure to check in at least 30 minutes prior to anticipated departure at the Gray Line Visitor Center. Night Tour – will not operate on New Year’s Eve. Heating coils are situated throughout the top deck flooring to provide comfort in cool weather. During cold weather periods, a removable canopy has been constructed from a clear, see-through material, allowing both warmth and complete visibility. Buses are wheelchairs accessible. Double-decker buses with lower level seating are marked with the symbol and disabled customers can board them at any of our stops. These buses have ramps and securement for two wheelchairs on the lower level. My second trip to NYC and the best tour yet! Crowded bus, long lines to activate voucher, bored sales keeper and the guy on the corner got mad at us because we weren’t doing it right apparently. Another guy quickly took over and was very polite. For the money I feel as though we should have taken the subway for the second day as the drivers were less than nice and/or helpful.